Self packed moves are permitted!! As you pack, keep in mind that an inventory list is mandatory for the clearance through customs overseas - Blank inventory sheets be provided by your moving coordinator. Goods such as dishes, table lamps, pictures, or other fragile items must be packed in boxes. These boxes should be stuffed with crushed packaging paper. All pictures and glass should be wrapped in bubble wrap or cardboard. All appliances need to be disconnected with cords wrapped up. Have no loose items in boxes. Try to have your boxes uniform in size. Rakes, shovels, and brooms should be taped together. All shelves should be removed from cabinets. Goblets and stemware should be packed one at a time next to each other. All lamps need to be packed in appropriate boxes. First remove the shade from the base, and then pack them both separately. Light bulbs should be removed and packed separately as well. It is advisable to remove pedals from bikes and place them in a bike carton. Do not pack any flammables, combustibles, or explosives. Movers are not allowed to transport aerosol spray cans, paint thinner, gasoline, or anything else of a flammable or explosive nature. Pack your mattress and box spring in mattress bags to protect from soiling. Sealing tape, a black felt marker, and your master list will be of value. Make a box of essentials and label it “Open Me First”. Put this box to the side to be loaded last (so it’s unloaded first) or take it yourself. Label one box "Set Up". In this box put all the screws, nuts and bolts and other pieces needed to put your furniture back together. Place each set of screws in a small bag with a label indicating which piece of furniture it was from. Some companies may suggest taping the bag to the furniture. The problem with this is that the tape may come loose and you'll lose your pieces or the tape is too strong and you peel off the finish on your furniture. Label all your boxes according to the room you’d like them placed in. Example: (kitchen, master bedroom, living room, etc). For long haul moves make sure you label all of your cartons with your name, destination, city and contact phone number. Mark all boxes containing breakables with a red marker, writing "FRAGILE" on all four sides and the top. Pack room-by-room. Do not include goods from the living room in boxes with goods from the kitchen for example. This will save you much confusion when unpacking. Pack heavy items at the bottom of the boxes. Pack all your boxes full, so it can hold the weight of another box on top of it. Once a box is packed, seal carefully on top and bottom. The contents of the box should be recorded on the master list. Place all packed boxes in your garage or on the main floor for easy pick up. When packing, CDs, records, dishes, or any disks always place them standing vertically as opposed to on top of each other in a box. When you are packing dishes, cups or any breakables, remember to place a layer of crumpled paper at the bottom of the box and between each layer. Try to keep the weight of the box under 45 lbs. The heavier the item is, the smaller the box. Take all knobs and screws off dressers, China cabinets. You can keep these essentials into our “Set Up” box for future assembly. Mark “Do Not Load” on anything you don’t want the movers to take and set them aside in a corner of a room or a designated area. Separate items with paper to prevent scratches caused by rubbing during transit. Wood restrictions: Wood pallets must be heat treated in order to prevent the spread and plant and pest diseases. Some countries will also require an additional fumigation upon importation. Labeling: Before placing the items onto the pallet, place a label on the side of your boxes. You will also want to place two labels on the pallet once the pallet is shrink wrapped. Information to put on the labels consists of a booking and reference numbers that we will give to you with. Include names, addresses and phone numbers both at origin and destination. Size & Weight: Pallets exceeding 2,200 lbs. or 70" in height or 119" in length or 80" in width may require prior approval. May also result in additional cost and/or special equipment. Stacking the pallet: Distribute the weight as evenly as possible. Stack boxes and other items as squarely as possible, try not to allow items to hang over the edges. You can place angled fiberboard between cartons and at the top of the pallet to prevent crushing. Wrapping: Wrap the pallet in 70-gauge stretch wrap, available at most packing supply stores. Complete a minimum of two bands (tightly) around the pallet bottom to top and top to bottom. 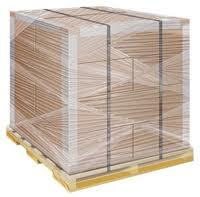 If possible use rayon, polypropylene, nylon or polyester strapping to secure the items to the pallet. Your initial LCL estimate includes the palletizing of your items. You do have the option to palletize your cargo yourself, which will result in a decrease in price. Typically you will save between $1 and $3 per cubic foot. If you are using Port to Port/Port to Door service, your cargo will need to be palletized when delivering your cargo to our port warehouse. If you choose to deliver your items directly to the shipping terminal and cannot palletize the cargo, our warehouse staff will do it for you at a cost of $75 per pallet. When palletizing your items on a pallet, it can be loaded up to 6 ft. high. Once you have placed all your items onto the pallet, you will need to wrap the goods to the pallet with shrink-wrap plastic. A standard pallet is approximately 48" x 40" x 6' in height. You are allowed to use pallets of different sizes and forms however, the pallet must be able to be lifted by a forklift.